FRANCESCO BOLLA, winemaking family tradition since 1883: Also William Tell would have enjoyed Dròmos ! Also William Tell would have enjoyed Dròmos ! 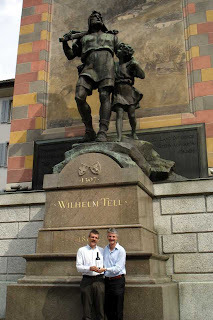 Bruno Bonfanti and myself carrying a bottle of Dròmos 2004 in front of the statue of William Tell, the Swiss hero. Dròmos has been the star at the three days tasting "Vin Uri 2007" organized by Enzo Filoni in Altdorf, the hometwon of William Tell. In the nearby Rütli the Swiss Confederation was founded in 1291.